While designing the curriculum the advisory and the managing body of SAI International Residential School had a brainstorming session as to how to design a curriculum to map the minds of the children yet make it different and enjoyable. They came to a conclusion that it should be made in such a way that it meet and understand the needs of the students, a program that is responsive to the intellectual strength and personal interest. With the contemporary set up of the classroom nowadays the subject matter and the curriculum needs to be diversified and cater to a variety of learning profiles. Hence after a lot of research and planning, SIRS came into being with a unique structure in learning and teaching. It is also just like any other school which provides education but the main difference is that SIRS believes in experiential learning for the holistic development of the body and the mind. SAI International Residential School emphasizes not only on education but also on value education while other international schools in India give more importance and concentrates on academics only. SIRS believes that with education one can learn and gain bookish knowledge but value educations make you a good human being, who understands the value of life and the importance of life skills. SIRS has an unrivaled campus, design on the tenets of Buddhism and is inspired by the Buddhist Architecture. The 40 acres large campus is well spread across with the world-class infrastructure. It has one of the best Sports Stadium which no other Residential School offers. 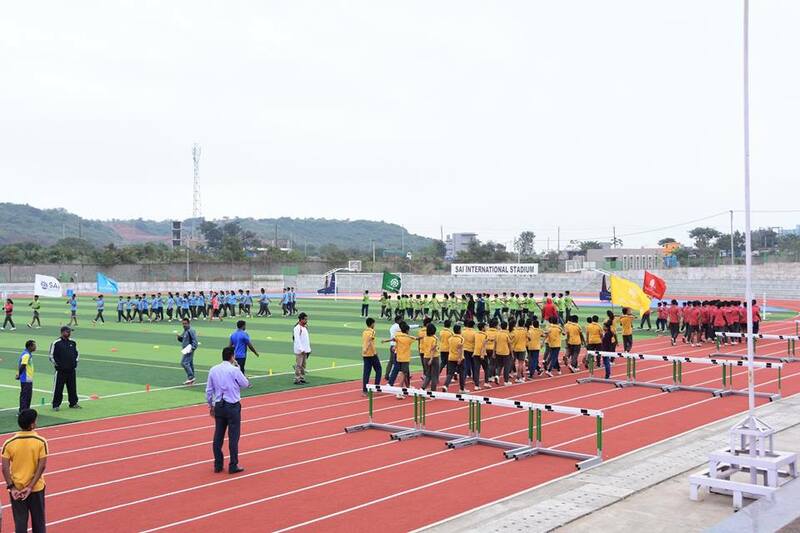 SIRS provides state-of-the-art outdoor sports facilities to the students for a healthy mind and body with trained coaches in their specific area. SIRS resides on the outer edge of the city, surrounded by lush green hills and land away from the madding crowd. 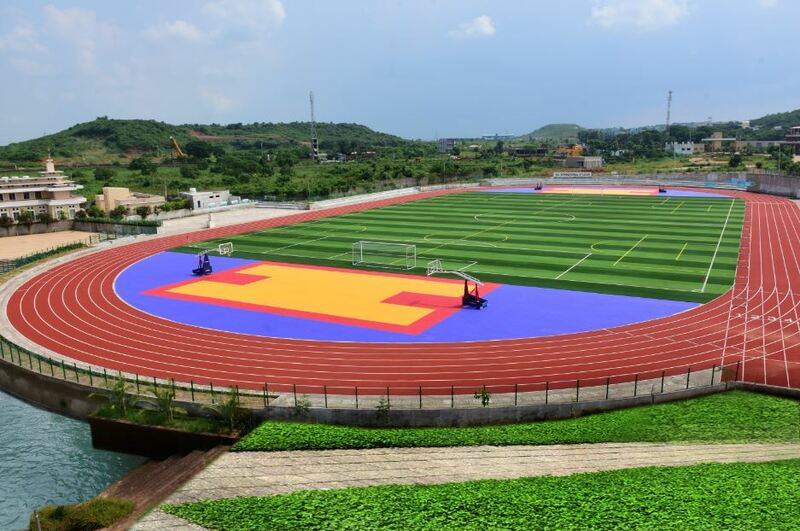 SIRS has one of the most impressive world-class sports stadium with 400 meters track with 8 lanes for all field and track events. It has one of best football grounds in Odisha beautifully laid with artificial turf with overwhelming size. The stadium incorporates two basketball courts with proper dimensions, facilities of swimming, horse riding also known as a royal sport is a big attraction for the children, volleyball, cricket, lawn tennis, table tennis, and a skating ring too just to name a few. The stadium has the seating capacity of more than 2000 people. Children fall in love merely by the look of the stadium which has the potential to host international events too. Talking about the infrastructure, the residential school has two fully air-conditioned hostels for both boys and girls with their own swimming pools. It has a huge Auditorium to host internal and external activities. It has an extensive library with more than 5000 books in different languages, music CDs, audio CDs, magazines, newspapers in many languages. Students of our boarding school have free access to the library both physically and digitally. The library is also well equipped with computers, Wi-Fi, printer and a scanner for students use. The USP of the library is that the SIRS Central library does not have the ‘pin drop silence rule’ unlike other libraries. Children are free to discuss in the library about the book they like. The meticulously planned cafeteria offers the children the most balanced and nourishing diet under the supervision of dietician for the proper growth of the children keeping in mind the age and need in each child. Special leadership programs are devised for the students of our boarding school to nurture and hone their leadership skills. Children are taken to leadership adventure camps they undergo military crash training in its Netritva/ Leadership camp at the foothills of the Chandaka forest. The main aim of the leadership camp is to harness the leader within each child. The residential school also has student’s council where students are guided and mentored by the teachers to help them learn and to set targets, analyze and modify plans for their exemplary performance throughout the year. Moral Value, ethics, and resilience are also invoked in the students. Traveling is always convivial but traveling with a friend to a far off land is an experience in itself. SIRS- Global Immersion Program is an innovative plan for the exchange and experiential education, where students come back from an international destination with knowledge by exploring and interacting. It’s all about nurturing the body mind and soul through yoga and meditation at SIRS. The Residential School helps to instill the yoga and meditation practices for a better, fitter and a healthier being. It awakens the soul and guides in the right direction and bestows happy living. Yoga is imbibed as a way of life in the students of SIRS. Children learn to develop critical thinking through discussions, debates, workshops, and sessions held at the school. To make the students future ready for the 21st century, the schools need to introduce Artificial Intelligence in the curriculum. The students of our boarding school are offered the opportunity to learn the fundamentals of Robotics, AI and IOT. It covers multiple sciences, math and technology disciplines including machine learning, artificial intelligence, data science, design, and engineering. It’s not just teaching at SIRS the teachers are specially trained through workshops to be compassionate, empathetic and loving towards students. The other USP of SIRS is the student-teacher connect. The teachers are aware of each and every development in a child; students are closer to their teachers than their parents. The school believes in holistic parenting and protects and nurtures the children just the way parents would do. SIRS is a ‘home away from home’.Parents are involved in a few programs of the school and they too are made to feel at home in the school premise. Teachers are in regular touch with the parents on the progress of their children. Teachers are always upgraded by workshops and training designed to match with the diverse needs of the 21st-century children. SIRS holds special training programs every week bi-monthly and annually. Only academic knowledge doesn’t serve all the purpose of an International school, children need to learn the real side of life as well. For the purpose of developing entrepreneurial skills children are exposed to events which they handle all by themselves from conceptualizing, finance and logistics they handle everything and are responsible for the complete show. Education is an amalgamation of knowledge, skills, discipline with joy and happiness and education at SIRS is HAPPINESS derived. At SIRS it is believed that a happy class is a productive one, the happier the classes more productive the school becomes leading to a high happiness quotient that further leads to making children emotionally secure and balanced.